There are many ways in which this year's World Championships were different from the previous Worlds in France in 2000. 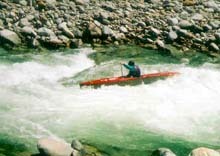 The U.S. Wildwater Team fielded four K-1 men, four C-1 men and a C-2 in a competition that was challenging for every nation. The Sesia River in Italy is a naturally flowing stream fed by the glaciers of Monte Rosa and the southern slopes of the Matterhorn in Switzerland. Even on days when the weather was warm and calm, the water elevation fluctuated and provided varied challenges. The preparation for racing on the Sesia called for short sprint fitness over the classic course as well as strength on the short sprint course. The team represented the U.S. well and there were several compliments from the international community on several team performances. 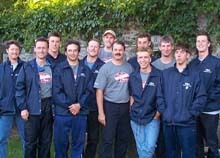 The U.S. K-1 men represented, in many ways, a youth movement, including Andrew McEwan, Middy Tilghman, and Simon Beardmore, along with Chris Hipgrave. In C-1, veterans Chris Osment and Bob Bofinger were part of the four man group with Tom Wier and first-time team member Ed Gordon. Mike Harris teamed with newly minted team member Jim Smoot in C-2. While the U.S. contingent was not a fully fielded team, we were one of the larger contingents in the list of twenty-six nations attending the World Championships. Three U.S. K-1 men for the World Cup Races arrived early and were able to participate in a part of the main event. Steve Kauffman and Joe Barkley were forerunners for the World Championships and Wildwater stalwart Charlie Albright was also there supporting the team. David Mason was and ICF judge and supervisor for the start. David Jones, head of the U.S. Wildwater committee, along with his son, Stuart,were there lending coaching and racing experience to the team and assisting with shuttles and race meetings. Ben Sandiford was on hand to introduce 2003 Kern World Cup organizer Terry Valle to officials and team leaders from other nations. The full U.S. contingent including athletes, friends and family was 30 people. Athletes and team leaders from other nations noticed, and commented favorably about the support and size of the U.S. contingent.They recognize that we are an important part of the international family of Wildwater Racing, and they showed appreciation for our efforts to bring a large team and support group every year. The U.S. team gave similarly strong showings at the races. Andrew McEwan finished 23rd out of 79 K-1 men, and a very respectable 5% from winner Boris Saunier of France.Chris Hipgrave also had a good race, as did Simon and Middy who were very near Hipgrave's time. Tom Wier had a solid race in C-1, the class for which Italian Vladi Panato won for the fifth consecutive World Championships. In C-2, Slovakia's Vala and Slucik also captured their fifth gold honor. U.S. Team canoeist Bob Bofinger slips down the Sesia's glacial streambed. Another notable was Italian Roberto Pontorollo who captured a fifth silver in the World Championships. While hopes for gold did not pan out, Pontorollo was cheered by Germans, Americans, British and others even as Saunier stepped to the top of the podium by mere hundredths of a second. There was another notable event for the Americans. In the team races in K1, Chris Hipgrave teamed with Andrew McEwan and Middy Tilghman to finish eighth overall. During the team races, an ICF official from Britain and the team leader from Germany complimented the US kayakers and canoeists, saying that they appeared to be working together in the race "like good paddling teams should do." For those of us who saw the American C1 and K1 team races, we have to agree that they were tight together on the course, working together and pushing each other down the course. The team went on to Bovec, then to Mayrhofen, with a full K1 men roup of six boats, C1 and C2 boats, and two K1 women at Mayrhofen, Austria and Karlovy, Czech Republic. Out of 18 nations in the World Cup races, the US team was the sixth largest contingent. Throughout the World Championships and World Cup events, other nations commented on the size and skills of this years team – a good showing in preparation for next year's home field advantage. Chris Osment is the U.S. Wildwater Team manager and an athlete living and training in Bern, Switzerland. Reach him at Chris.Osment@dialog.com.